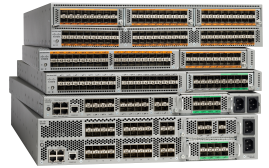 I was pretty excited to get my hands on some of the Cisco Nexus product line which focuses on switching in the data center. The gear I have is an evaluation unit so I made some notes and one thing I was impressed is how easy it is to connect a Nexus 5K to a Nexus 2k also known as a fabric extender. I have kept it simple as the gear I have is a single Nexus 5596 along with a single Nexus 224TP-E who needs redundancy right? So in this post I’ll explain how to connect a 5k Nexus to a 2k extender. Let’s get started! Now in configuration mode we have to turn on a feature in the NX-OS to enable FEX, we do this by issuing the “feature FEX” command. The Nexus runs on efficiency and only loads what it needs or configured. This is familiar approach that Linux uses which loads what is installed and nothing else. In the output below we can see all the features that the NX-OS supports followed by the command to turn on FEX. Now that our FEX feature is active let’s configure the port that has the 2k connected and in this example I have it as ethernet port 48 on our 5k. The commands are petty simple, I first want to go into interface followed by changing the mode of interface and finally giving the interface a FEX associate ID. ❗NOTE: Since this design is a single stack we need to issue the FEX associate command on the physical interface. If you want redundancy you would usually put the FEX associate command with channel-groups and vPCs. Another helpful FYI is if you have channel-groups you don’t need to put the FEX associate command on the physical interface. You can also go into detail on the FEX by issuing the “show fex detail” which shows almost the same information has “show fex” but it includes the FEX ports, the status of those FEX ports and what port the fabric is connected. (Also called the 5k) as well as helpful logs for the 2k at the end of command. 12/01/2013 07:28:31.696577: create module inserted event. Believe it or not you now have a working 5k with a connected FEX, you could plug devices in and be ready to roll on a single stack 2k and 5k. One thing I’ve been impressed with the NX-OS it’s that familiar feeling of IOS with some improved differences, Cisco has good documentation on the common and different features when comparing NX-OS and IOS which is below. Like always I hope this post is helpful and I have a couple more Nexus posts in the works but other than that enjoy the remaining of 2013! Quick question: why port 1/48 down? I thought you configured that interface/port? Port 1/48 is not down on the 5k but on the 2k port 100/1/48 is down, this is a 1GB copper port and in the example I had nothing connected to the 2k. The 2k has four FEX ports that can be connected to a 5k or a 7k, however in this example I did not issue a command that shows the FEX port status, I’ll do some digging in finding an example but from what I can tell I think the “show interface fex-fabric” would show what uplink it is connected to and the status of the FEX link.